Objective: The aim of this study was to determine the effect of continuous training program on the correlates of white blood cell count (WBCc) and psychosocial stress in black African (Nigerian) male subjects with essential hypertension. Materials and Methods: Male subjects with diagnosis of essential hypertension attending the hypertensive clinic of Murtala Muhammed Specialist Hospital (MMSH), Kano, Nigeria form the population for the study. Two hundred and seventeen subjects with stage 1 and 2 [systolic blood pressure (SBP) between 140 and 180 and diastolic blood pressure (DBP) between 90 and 109 mmHg) hypertension were age matched and randomly grouped into continuous (112) and control groups (105). The continuous group involved in an 8 weeks continuous training (60-79% HR max) of between 45 and 60 minutes, three times per week, while the controls group remain sedentary. 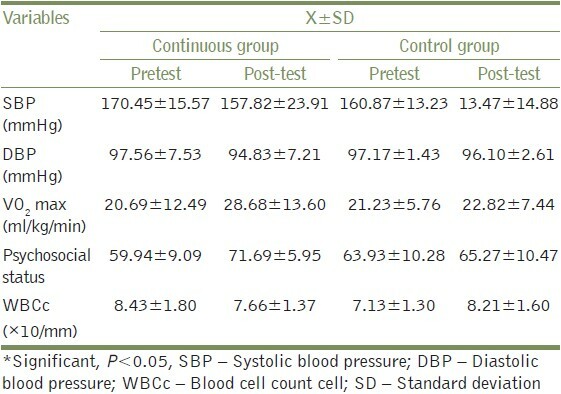 Blood pressure (SBP and DBP), WBCc, VO 2 max and psychosocial status were assessed. Student t test and Pearson correlation test were used in data analysis. Results: The study revealed significant beneficial effect of continuous training programs on VO 2 max, SBP, DBP, WBCc and psychosocial status (P< 0.05). Psychosocial status and WBCc were positively and negatively correlated, respectively, with VO 2 max at P< 0.01. Conclusion: This study supports the recommendations of moderate intensity (continuous) training program as an adjunct multi-therapy in blood pressure, inflammatory, and psychosocial stress management in hypertension. Changes in VO 2 max as a result of continuous exercise training would significantly correlate with changes in psychosocial status and WBC. The study design was age matched randomized independent-control group (pretest-posttest) design. The study duration was 8 weeks. Population for the study was male essential hypertensive subjects attending the hypertensive clinic of Murtala Muhammed Specialist Hospital, Kano, Nigeria. Subject were fully informed about the experimental procedures, risk and protocol, after which they gave their informed consent in accordance with the American College of Sports Medicine (ACSM),  guidelines, regarding the use of human subjects as recommended by the human subject protocol. Ethical approval was granted by the Ethical Committee of Kano State Hospitals Management Board. Sample size was determined using the sample size calculator by Creative Research System Survey Software (CRSSS) (Petaluma, CA, USA). Only those who volunteered to participate in the study were recruited. Subjects between the age range of 50 and 70 years with chronic stage 1 and 2 (>1 year duration) hypertension (SBP between 140-180 and DBP between 90-109 mmHg) were selected. Subjects on a single antihypertensive medication were recruited for homogeneity of previous drug therapy. They were sedentary and have no history of psychiatry or psychological disorders or abnormalities. Obese or underweight (BMI between 20 and 30 kg/m 2 ), smokers, alcoholic, diabetic, other cardiac, renal, respiratory disease patients were excluded. Those involved in vigorous physical activities and above averagely physically fit (VO 2 max > 27 and > 33 ml/kg.min for over 60 and 50-years old, respectively) were also excluded. A total of 323 chronic and stable, essential stage 1 to stage 2 male hypertensive patients satisfied the necessary study criteria. Subjects were aged matched and randomly grouped into experimental (162) and control (161) groups. Research design: In the present study, age-matched randomized double-blind independent groups design was used to determine the influence of the continuous training program on cardiovascular parameters. Wash-out Period: All subjects on antihypertensive drugs were asked to stop all forms of medication and in replaced, were given placebo tablets (consisted of mainly lactose and inert substance) in a double-blind method. , Also subjects including those not on any antihypertensive medications were placed on placebo tablets for 1 week (7 days); this is known as "Wash out period". The purpose of the wash out period was to get rid of the effects of previously taken antihypertensive drugs/medications. During the wash out period all subjects were instructed to report to the hypertensive clinic for daily blood pressure monitoring and general observation. The pretest and post-test procedures were conducted at the last day of the wash-out period. Subjects resting heart rate (HR), SBP, and DBP were monitored from the right arm as described by Musa et al.,  using an automated digital electronic BP monitor (Omron digital BP monitor, Medel 11 EM 403c; Tokyo Japan). The Young Men Christian Association (YMCA) submaximal cycle ergometry test protocol was used to assess subject's aerobic power (VO 2 max) as described by ACSM. The stress test (pre and post-training) was conducted under the supervision of experts in basic life support care and the emergency unit of the hospital was made ready to accommodate any incident that might occur during the stress test. The YMCA protocol uses two to four 3-minutes stage of continuous exercise, two HR-power output data points will be needed (steady state HR) of between 110 and 150 beat/min. The two steady states' HR were plotted against the respective workload on the YMCA graph sheet. A straight line was draw through the two points and extended to the subjects predicted maximum HR (220-Age). The point at which the diagonal line intersects the horizontal predicted HR max line represents the maximal working capacity for the subject. A perpendicular line was dropped from this point to the baseline where the maximal physical workload capacity was read in kg.m.min -1 , which was used to predict the subjects VO 2 max. This procedure was done for both pre and post-test stress test. Following stress test and prior to the exercise training, all subjects in both control and continuous groups were re-assessed by the physician and were prescribed with antihypertensive drug; methyldopa (aldomet) as necessary. Aldomet was preferred because it does not alter normal hemodynamic responses to exercise  and it is a well-tolerated antihypertensive drug in the Africa  and mostly prescribed in the northern part (Kano) of the country where the study was conducted and useful in the treatment of mild to moderately severe hypertension. Subjects maintain these prescriptions with regular medical consultation and observation throughout the period of exercise training. Subjects in the continuous group exercised on a bicycle ergometer at a low intensity of between 35-59% of their HR max as recommended by ACSM. The starting workload was 100 kgm (17 watts) which was increased at a pedal speed of 50 rpm to obtain a HR max reserve 35% was increased in the first 2 weeks to and level up at 59% HR max reserve throughout the remaining part of the training period. The initial of exercise session was increased from 45 minutes in the first 2 weeks of training to and leveled up at 60 minutes throughout the remaining part of the training. Exercise session of three times per week was maintained throughout the 8 weeks training period for continuous group. Subjects in the control group were instructed not to undertake any vigorous physical activity during the 8-week period of study. Wash out Period : At the end of the 8-weeks training period, all subjects were asked to stop methyldopa (aldomet) and subjects were prescribed with placebo tablets for 1 week as in pretest procedure. Post-training SBP, DBP, CRP, WBCc, assessment feeding and stress test were conducted as earlier described in the pretest procedures using standardized protocols, techniques and methods. All pre and post-test measurements were recorded on a data sheet. Two-hundred and seventeen subjects (112 from continuous, and 105 from control group) completed the eight weeks training program. One hundred and six subjects (50 from continuous, and 56 from control group) had dropped out because of non-compliance, unfavorable responses to methyldopa and exercise training or had incomplete data; therefore, the data of 217 subjects were used in the statistical analysis [Figure 1]. Following data collection, the measured and derived variables were statistically analyzed. The descriptive statistics (Mean, standard deviations, and % change) of the subjects physical characteristics, estimated VO 2 max, WBCc, cardiovascular parameters were determined. Students' t test and Pearson product moment correlation test were computed for the variables of interest. All statistical analysis was performed on a Toshiba compatible microcomputer using the statistical package for the social science (SPSS), (Version 16.0 Chicago IL, USA). The probability level for all the above tests was set at 0.05 to indicate significance. The subjects' age ranged between 50 and 70 years. Mean age, height, weight and BMI: of subjects in continuous exercise group were (58.63 ± 7.22 years, 1.73 ± 6.97 m, 67.49 ± 10.16 kg, 22.48 ± 2.89 kg.m -2 ), respectively while for the Control group Mean age, height, weight and BMI were (58.27 ± 6.24 years, 1.68 ± 5.31 m, 68.47 ± 17.07 kg, 23.37 ± 5.31 kg.m -2 , respectively). There was no significant difference in age (t = 0.390, P = 0.697), baseline SBP (t = 0.540, P = 0.597), baseline DBP (t = 0.530, P = 0.597), and baseline VO 2 max (t = -0.406, P = 0.685) between groups. The physical characteristics of the subjects were comparable [Table 1]. 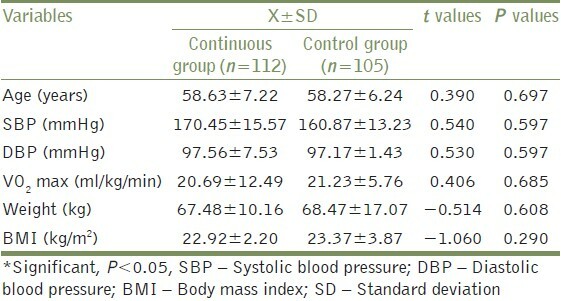 Groups pre and post-treatment mean BP ± SD mmHg; psychosocial status, WBCcSUA (×10/mm) and VO 2 max ml.kg -1 .min -1 are depicted in [Table 2]. Changed score values and Students' t test results [Table 3] indicated a significant effect in the exercise groups over control in SBP (P = 0.000), DBP (P = 0.040), psychosocial status (P = 0.000), WBCc (P = 0.000) and VO 2 max (P = 0.000) at P < 0.05. There was significant baseline (pretest) correlation between WBCc and other variables: SBP (r =0.344); DBP (r = 384); VO 2 max (r = -0.247) (Minus 0.247); Psychosocial status (r = -0.202) [Figure 2]. 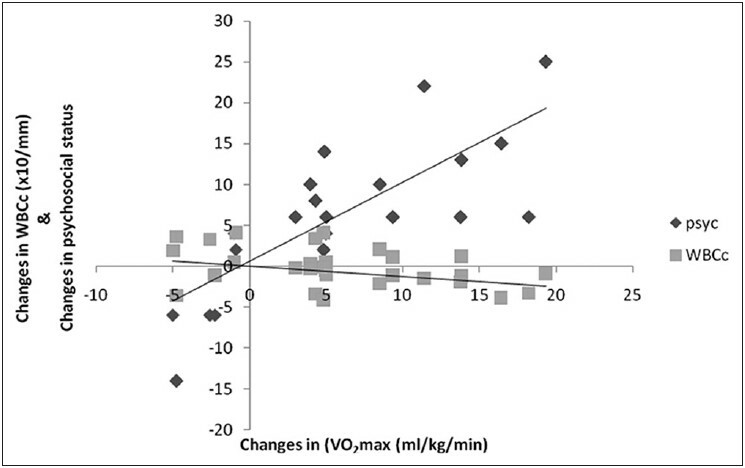 There was a significant positive and negative correlation between changes between changes in VO 2 max and changes in psychosocial status (r = 0.729) and changes in WBCc (r = -0.418), respectively, at P < 0.01 [Figure 3]. 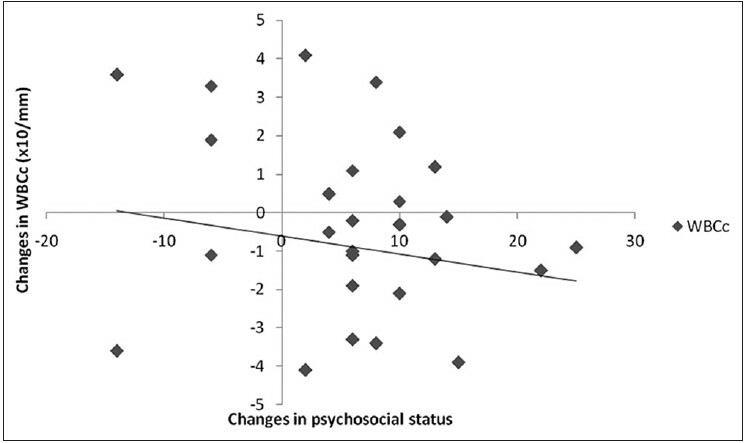 There was also significant negative correlation between changes in psychosocial status and changes in WBCc (r = -.202) at P < 0.05 [Figure 4]. The purpose of this study was to test the hypotheses that: there would be significant correlation between baselines (pretest) WBCc and other baseline (pretests) variables such as BP, VO 2 max and psychosocial status. Secondly, there would be significant difference between experimental and control groups in blood pressure (BP), psychosocial status and WBC. Finally, changes in VO 2 max would significantly correlate with changes in psychosocial status and WBC. All the hypotheses were supported by the results of the present study. Findings from the present study revealed a significant decrease in SBP, DBP, WBC and increase in VO 2 max in the continuous group over control group. The favorable changes resulting from aerobic training in both SBP and DBP demonstrated in the present study is consistent with several other studies. ,, Also, results of the present study indicated a significant increase in psychosocial wellbeing (reduction in psychosocial stress) and significant decrease in WBC in the continuous group over control group. 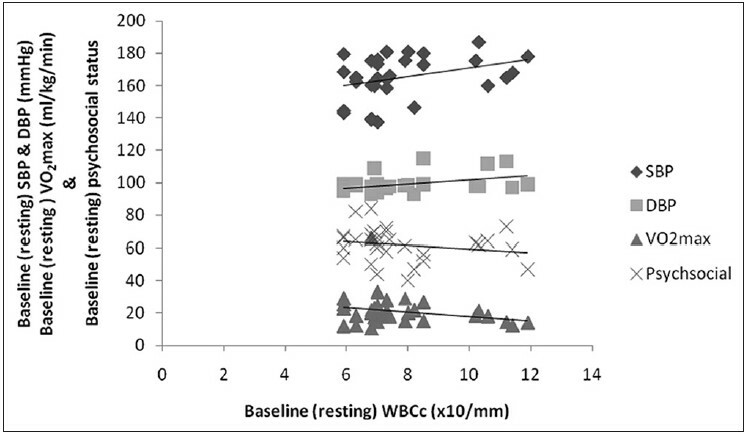 Changes in VO 2 max significantly and negatively correlated with changes in WBC and positively correlated psychosocial status. A lso changes in WBC significantly and negatively correlated with changes in changes in psychosocial status. It is generally at large accepted that the physiological mediator of low grade chronic inflammation such as WBC is the tumor necrosing factor-alpha (TNF-α), which has been proven to be downregulated by regular physical activities. Another mechanism is that the post-exercise hypotension which is accompanied by a decrease in serum cathecolamines, norepinephrine, dopamine, cortisol, sympathetic nervous system, plasma rennin activity, , thus suppressing inflammatory reaction and finally downregulating WBC concentration. Based on the results of the present study, it was concluded that psychosocial stress, elevated WBC and hypertension are interrelated. The study also concludes and supports the recommendations of moderate intensity (continuous) training program as a multi-therapy in blood pressure reduction, anti-inflammatory (WBC) and psychosocial stress management in hypertension. However, the antihypertensive effect of the training program may be through the suppression of the chronic inflammation such as WBC. Tomson J, Lip GY. Blood pressure demographics: Nature or nurture genes or environment? BMC Med 2005;3:3-6. Boos CJ, Lip GY. Elevated high-sensitive C-reactive protein, large arterial stiffness and atherosclerosis: A relationship between inflammation and hypertension? J Hum Hypertens 2005;19:511-3. Vazquez-Oliva G, Fernandez-Real JM, Zamora A, Vilaseca M, Badimon L. Lowering of blood pressure leads to decreased circulating interleukin-6 in hypertensive subjects. J Hum Hypertens 2005;19:457-62. Bautista LE. Inflammation, endothelial dysfunction, and the risk of high blood pressure: Epidemiologic and biological evidence. J Hum Hypertens 2003;17:223-30. Bautista LE, Lopez-Jaramillo P, Vera LM. Is C-reactive protein an independent risk factor for essential hypertension? J Hypertens 2001;19:857-61. Mugge A, Lopex JA. Do leucocytes have a role in hypertension? Hypertension 1991;17:331-3. Sinisalo J, Paronen J, Muttila KJ, Syrjata M, Alfthan G, Palosuo T, et al. Relation of Inflammation to vascular friction in patients with coronary heart disease. Atherosclerosis 2000;149:403-11. Ito BR, Schmid-Schnobein G, Engler RL. Effect of leucocyte activation on myocardial vascular resistance. Blood Cells 1990;16:145-63. Friedman GD, Selby JV, Qveseroberry CP. The leukocyte count: A predictor of hypertension. J Clin Epidemiol 1990;43:907-11. Kuchel O. The autonomic nervous system and blood pressure regulation in human hypertension. In: Genest J, Kuchel O, Hamet P, Cantin M, editors. Hypertension: Pathophysiology and Treatment. 2 nd ed. New York: McGraw-Hill; 1983. p. 140-60. Cohen S, Tyrrel DA, Smith AP. Psychological stress and susceptibility to the common cold. N Engl J Med 1991;325:606-12. Herbert TB, Cohen S. Stress and immunity in humans: A meta analytic review. Psychosom Med 1993;53:364-79. O′Leary A. Stress, emotion and human immune function. Psychol Bull 1990;108:363-82. Straub RH, Dhabhar FS, Bijlsma JW, Cutolo M. How psychological stress via hormones and nerve fibers may exacerbate rheumatoid arthritis. Arthritis Rheum 2005;52:16-26. Mackinnon LT. Exercise and immunology human kinetics books. Champaign; 199 2. Hilton A. The effect of strenuous exercise, calorie deficiency and sleep deprivation on white blood cells, plasma immunoglobulins and cytokines. Scand J Immunol 1996;43:228-35. Galvao DA, Nasaka K, Taaffe DR, Peake J, Spry N, Suzuki K, et al. Endocrine and immune responses to resistance training in prostate cancer patients. Prostate Cancer Prostatic Dis 2008;11:160-5. Bruunsgaard H. Physical activity and modulation of systemic low-level inflammation. J Leukoc Biol 2005;78:819-35. Nicklas BJ, Brinkley TE. Exercise as a treatment for chronic inflammation in older adults. Exerc Sport Sci Rev 2009;37:165-70. Pendergrass SA, Hayes E, Farina G, Lemaire R, Farber HW, Whitfield ML, et al. Limited systemic sclerosis patients with pulmonary arterial hypertension show biomarkers of inflammation and vascular injury. PLoS One 2010;5:e12106. Nicklas BJ, Hsu FC, Brinkley TJ, Church T, Goodpaster BH, Kritchevsky SB, et al. Exercise training and plasma C-reactive protein and interleukin-6 in elderly people. J Am Geriatr Soc 2008;56:2045-52. American College of Sport Medicine. Guide lines for exercise testing and Prescription. 4 th ed. Philadelphia: Lea and Febiger; 1991. Townsend RR, Mcfadden TC, Ford V, Cadee JA. A randomized double blind, placebo-controlled trial of casein protein hydrolysnte (C12 peptide) in human essential hypertension. Am J Hypertens 2004;17:1056-8. Musa DI, Ibrahim DM, Toriola AL. Cardiorespiratory fitness and risk factors of CHD in pre-adolescent Nigerian girls. J Hum Mov Stud 2002;42:455-5.
International Society for the Advancement of Kinanthropometry (ISAK). International standards for anthropometric assessment. Patche Fstroom: ISAK; 2 001. Bachorik PS. Collection of blood sample for lipoprotein analysis. Clin Chem 1982;28:1375-8. Barbieri M, Ferrucci L, Corsi AM, Macchi C, Lauretani F, Bonafe M, et al. Is chronic inflammation a determinant of blood pressure in the elderly? Am J Hypertens 2003;16:537-43. Dacie JV, Lewis SM. Practical Hematology. 5 th ed. London: Churchill Livingstone; 1975. Stephens T, Graig CL. The well being of Canadian: Highlights of the 1988 Cambell Survey. Ottawa Canadian fitness and lifestyle Research Institute; 1990. American College of Sports Medicine. ASCM′s guidelines for exercise testing and prescription, 5 th ed. Baltimore: Williams and Wilkins; 1995. Katzung BG. Basic and Clinical Pharmacology. 7 th ed. New York: Lange Medical Books/Craw Hill; 1998. Mancia G, Ferari L, Gregorini L, Leonett L, Terzoli L, Biachini C, et al. Effects of treatment with methyldopia on basal haemodynamic and on rural control. In: Robertson JS, Pickering GW, Goldwell AD, editors. The therapeutics of hypertension: London: Royal Society of Medicine and Academic Press Inc. Ltd; 1980. p. 70-8. Salako LA. Treatment of hypertension: Cardiovascular disease in Africa. Ibadan: Ciba Geigy Ltd; 197 6. American College of Sport Medicine. Physical activity, physical fitness and hypertension. Med Sci Sports Exerc 1993;25:1-10. Laterza MC, Demator LD, Trombetta IC, Braza AM, Roveda F, Alves MJ, et al. Exercise training restores baroreflex sensitivity in never trained hypertensive patients. Hypertension 2007;49:1298-306. Westhoff TH, Franke N, Schmidt S, Valbracht-Israng K, Meissner R, Yildirim H, et al. Too old benefit from sports? The cardiovascular effects of exercise training in elding subjects treated for isolated systolic hypertension. Kidney Blood Press Res 2007;30:240-7. Brooks GA, Fahey TD, White TP. Exercise physiology, human bioenergetics and its application. 2 nd ed. Mountain View: May Field Publishing Company; 1996. Hagberg JM. Physical activity, fitness, health and aging. In: Bouchard C, Shepard R, Stephens T, editors. Physical activity, fitness and health international proceedings and consensus statement. Champaign: Human Kinetics Publishers; 1994. p. 998-1005. Rubin RT. Pharmacoendocrinology of major depression. Eur Arch Psychiatry Neurol Sci 1989;238:259-67. Sothman MS, Ismail AH. Relationships between urinary catecholamine metabolites, particularly MHPG, and selected personality and physical fitness characteristics in normal subjects. Psychosom Med 1984;46:523-33. Droste SK, Gesing A, Ulbricht S, Muller MB, Linthorst AC, Reul JM. Effects of long-term voluntary exercise on the mouse hypothalmic-pituitary-adrenocortical axis. Endocrinology 2003;114:3012-23. Dishman RK, Renner KJ, Youngstedt SD, Reigle TG, Bunnell BN, Burke KA, et al. Activity wheel running reduces escape latency and alters brain monoamine levels after footshock. Brain Res Bull 1997;42:399-406. Dunn AL, Dishman RK. Exercise and the neurobiology of depression. Exerc Sport Sci Rev 1991;19:41-98. Esler M, Jennings G, Lambert G, Meredith I, Horne M, Eisenhofer G. Overflow of catecholamine neurotransmitters to the circulation: Source, fate, and functions. Physiol Rev 1990;70:963-85.